Discussion in 'Property Tours' started by Chainsaw, Oct 9, 2016. Okay Dave, I just smoked a back strap and wanted to post it for you while it is fresh in my mind. 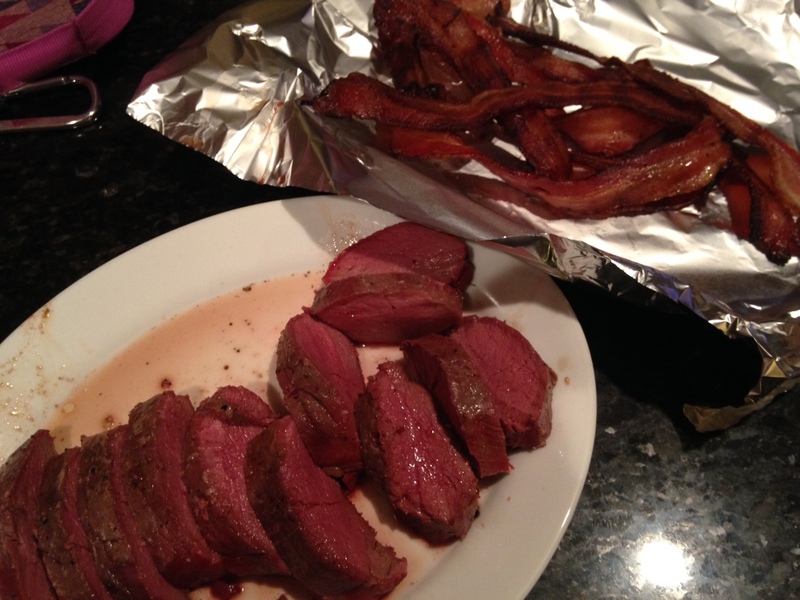 This was done on a camp chef pellet grill and was a one year old back strap. I had to take plates away so some was left for my youngest when she gets home. It was that good! Salt back strap heavily and pepper. 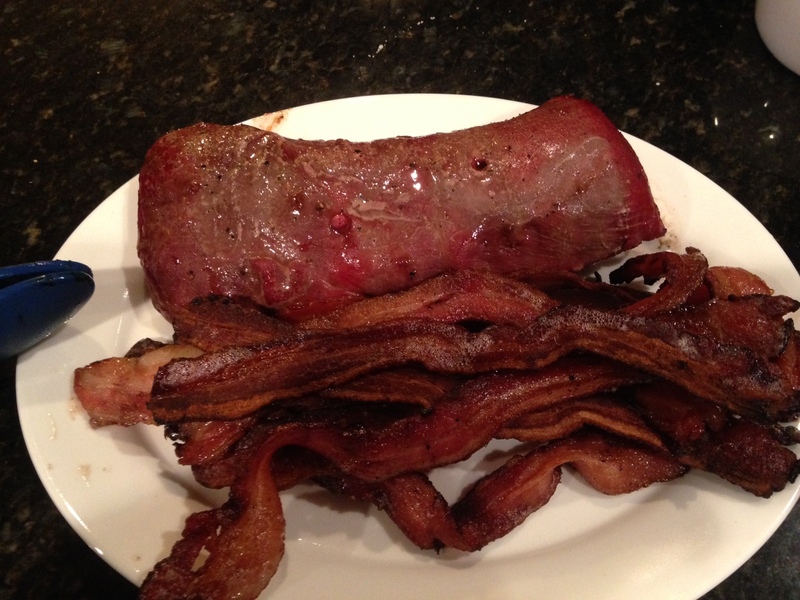 Meat was cooked perfect and bacon ended up crispy. Previously I thought I took bacon off grill. That was wrong, finish it with the meat. I'm going to try this as well but I'll finish in oven as my green egg doesn't change temps very fast or is the slow temp change part of the cook?? 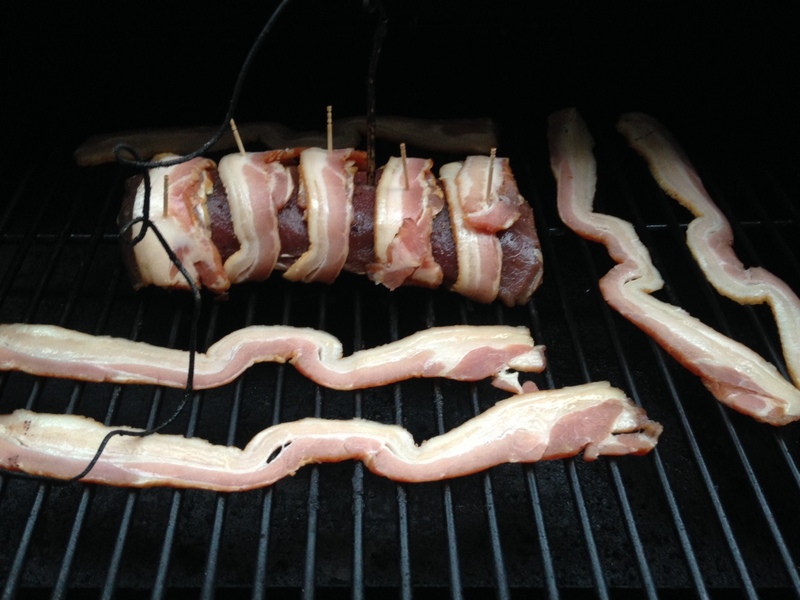 I’ve smoked a number of bacon wrapped backstraps. I have to cook way slow get good smoky flavor on my Traeger. If I’m going to cook quickly, I’d rather marinate, slice into 1/2” steaks and grill at high temperature or fry them up. Just my 0.02. As of noon today the hunting is still slower than slow. The rain is relentless and the shifting winds are all in the deer's favor. It is even difficult to catch a glimpse of a spike every couple of days let alone a mature deer. There is very minimal deer movement here now; While the season started out with a great bang, it has fizzled quickly. Rifle season opened October 20 and since then I have heard all of five shots total and those shots sounded like they could have been miles away from us; One would think there were near zero deer here. We know better and have seen it before but it is still hard to believe. Hopefully when things break it will be hard to believe because we will be seeing so much movement. We keep saying "Probably Tomorrow". I think that we just plain started too early; we know better but! Resolved to sit on the ground and still be mobile yet somewhat dry I purchased a bunch of 5 dollar umbrellas from Home Depot yesterday; Tying an umbrella to a shooting tripod makes for a very mobile and fairly dry ground stand. We have Rednecks but I enjoy hunting from the ground until the weather becomes too tough to be outside.So at least I am dry and happy out there. I'll keep at it everyday for five hours or so until it breaks but my hunting buddy Roger has been at it all day today. He has been in his stand since before dawn but is in a Redneck; hope he didn't sleep all day and has a few stories for tonight when he gets back in. Elk when you say slow cooking--what temperature do you use for slow? Either way would work. I do it to speed up the process. I like a kiss of smoke on venison. I have heard maybe 3 shots. I had one mature buck show up 10/25 but he was one pic and done. Does and fawns are still walking around like the rut is nonexistent. How quickly things change. At 5 pm my neighbor calls to tell me there are ten deer in my field across from his house and there is a buck chasing em. And while we are talking on the phone we hear a shot that we think is possibly from Roger as it sounds like it is coming from about where the Redneck is.. Rest of the story tomorrow. It's Jagermeister Time for now! THE RUT IS FINALLY ON HERE NOW! Merle Hawggard and dogghr like this. I find I need 3-4 hours of smoke to provide the flavor I like. On my Traeger, I’ll use the smoke setting which goes from 170-200 or so. After insuring I’ve got the smoke flavor I seek, I’ll turn up the heat to finish. I wrap in bacon to keep it from drying out. I’m told using a smoke tube will really boost the smoke output. I’m going to give one a try. Skip (a.k.a. Roger) had sat in the Redneck all day long with only one extra small button buck seen that had come in for an up close(two feet away) visit. The Redneck though was a good choice for the day as the wind was swirling erratically bringing occasional deluges of rain on and off throughout the morning and with no killing frost here to date, the cover is very, very thick so in the woods visibility is less than twenty yards in most places. It was a difficult day to hunt low impact to say the least. We hadn't opened up the Redneck since last hunting season but to Skips' delight it was exactly as we left it, no dampness, no animal damage and no bugs inside and the high backed swivel and cushy leatherette office chair with the padded arm rests was also still in perfect condition; it is what I have come to expect every year but you never know. This Redneck Blind sits on a five ft. stand and is located in a Hickory grove overlooking a maize of food plot runs all connected to buck sidewalks and interspersed with a hundred plus wild apple trees. It is a great place to spend a day and the cameras were showing 4 different bucks in the 3 1/2 year old range were using that area but mostly at night. So on with the story in the very last seconds of legal shooting time while the sun was setting the nine point buck appears suddenly exiting a buck sidewalk about 94 yards out to cross the end of the food plot which is twelve yards wide. Skip had his rifle in a tripod pointed that way with the window open and it was a good thing because the deer was not stopping and took only a second or so to cross that opening. At the shot the buck lunged but Skip could not find any other sign of a hit and that single lunge had hidden the bucks exit. Anne and I had heard the shot (the only shot heard that day) so I changed into some older clothes in anticipation of loading the deer onto the side by side. 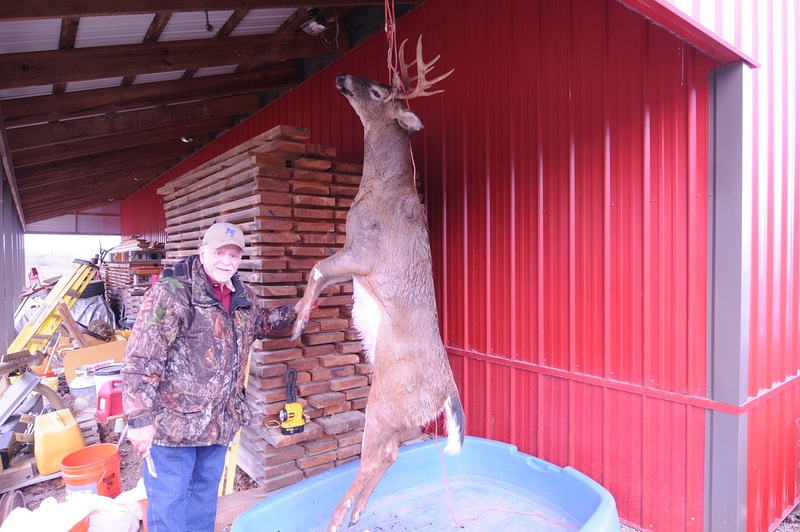 Skip has only ever missed one deer in hunting this property in 30 years so when he shoots we expect that loading up a deer is on the menu. When I arrived at the scene in total black darkness with the sound of a giant thundering rain deluge coming Skip was happy to see me. He knew he had hit it but the shot was a tough one and he wasn't sure where the bullet had hit it. Skip had seen a flag over "there" so was looking in that area when I arrived. We went back to the shot location and there were two drops of red blood and a few feet later a few more with maybe an air bubble or two in it. The storm was quickly upon us and the rain started,tracking was slow but steady and then it ended. Long enough story short the deer had doubled back and dove into brush leaving no sign where he dove. We kept checking the brush on each side of the blood trail and finally we found where the blood trail continued. At this point it is pouring, we follow the trail as quick as we could (lots of briers so it was tough going) and we find the deer about thirty yards from where it was when it had been hit. It was double lunged but hit high enough so external bleeding was minimal. Well we are evidently not as young as we feel; the deer was only thirty yards in from the food plot so all we had to do was drag the deer thirty yards to the side by side and then toss it in the back. It was a very heavy deer so Skip gutted it first and then we proceeded to tug on it. We would move it a little and then rest; Seven rests later and we had moved the deer the thirty yards to the side by side. However though we gave it all we had we could not lift, pull, roll or in anyway get that deer into the back of the side by side. So we went home, got the tractor and loaded him up. By now the rain dad stopped but it was very dark and the lights on the tractor weren't working so anyway we really had a great adventure just finding the deer and getting him home. It's really great to be older in some ways because things are more difficult to get done and thus maybe way more appreciated. The buck is definitely 3 1/2 years old which makes him special here, he is short on antlers as most of them are here, he is also huge as many of them are here but as triple C, farmhunter, dogghr, Okie and many others have said, each of the years that you can get to hunt with a life time friend is special indeed and that makes this a very special buck on that alone. Thanks for reading this. It was an adventure that us two old young guys really enjoyed. Tom, Thanks for the explanation on cooking temps used. Triple C, dogghr, lakngulf and 3 others like this. Great job and story. This endless wind and rain is offering some protection to these bucks so that makes it more sweet to take a big guy like that. I couldn't help but chuckle a little on the part describing how the chair and stand were still in good condition. A friend of mine found a turkey vulture had got into his over the summer and used it for a roost. His nice blue swivel chair was white from vulture droppings as was his floor and walls! Congrats Gents ! Great story about a great adventure involving an awesome animal. Thanks guys. Merle, I did but know I shouldn't have laughed about the roosting vulture but I could relate to that from adventures with wooden box stands of the past. You are right on Chummer, most bucks have survived to date thanks to the wind and rains and no hard freezes. And thanks Rusty, I'm hoping to hear of you running into some of those big bodied northern bucks soon. I saw daytime movement of a 2 1/2 year old yesterday; he was eating blackberry leaves by the handful for about twenty-five minutes right close to my position. He was a nice deer not counting he only had one antler left. The important thing is that some daylight movement has begun so the hunting will be a lot more fun over the next couple of weeks. I plan on spot and stalk all day Saturday with the high wind and snow on the way. Going in deep and not coming out without one. The ten day forecast could start the migration, looks cold and snowy. Maybe I will meet one of my deer down at your place. By 8 am it will likely be just you AND the giant bucks on the hill; it looks like it will be a tough day weather wise for most of us but a great day to hunt the old way. Good luck out there Jeremy and the offer to follow them big bucks all the way to here still stands. keep us posted. Got a question: What is that blue Tub laying under the deer while hanging for skinning? I have a "gut bucket" that is one of those plastic big buckets with the rope handle, but that tub your using looks like a great idea. Running 22 good working cameras has proven to be fun, interesting, educational and productive. 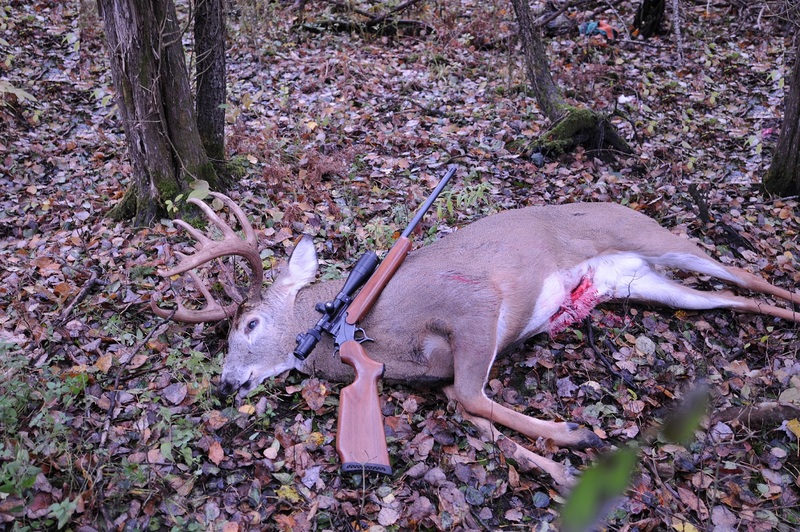 Skips' deer hunt described yesterday in post 508 was successful because of the all day sit and a great shot by Skip. However the cameras had photographed that deer and a couple of other possibles in that area so when the wind was right we concentrated our hunting there; Thus the cameras did have a part in the success of the hunt. The deer in the pic below was the only one of him we have collected so far from the trail cams. Thus we surmised if it were living on this property that it was likely hanging in the area where we had zero cameras or we probably would have had more pics of him. Conditions were right this morning for hunting one spot in particular about 1/2 mile away which connected to the above picture location with a major branch of drainage's and it had no cameras there simply because I had used them all up elsewhere on the property. And as luck would have it the big boy on the right was in fact there and this morning one-half hour into my sit he cruised by my ground seat at 23 yards. His pace was quick but he heard me "blat" and he stopped just long enough and with just enough shoulder showing thru the thick cover for me to place the 180 grain 7MM Rem Mag CORE-LOKT into it. Surprisingly the bullet did not pass thru even at that close range. The buck bolted at the shot but went down quickly. What a fantastic morning hunt it was! While the cameras were not directly responsible for the great hunt this morning they sure did put me onto this deer in the first place. He field dressed at 205 pounds. Recreating this deer woods has worked better than I even hoped it would. Thank you to everyone on the forum that that has helped me learn and encouraged me and kept my enthusiasm on steroids, it is a great trip to be on. HB_Hunter, weekender21, Lewi B and 7 others like this. Wow Dave, two great deer, and the mass on yours looks heavy. I knew when I saw all of the work that you were doing on your place that you would eventually reap great rewards. That time isn't in the future now - it has arrived!! So proud for both of you guys, and you have me pumped for our firearms opener tomorrow morning. Thanks Cutman and Steve. It is so exciting to see what has happened here and the work was really not that big a deal. I don't know that we can ever get deer to older than this but I'm pretty satisfied with this. The mass measurements Steve were all 4 3/8 to 5 and the longest tine was 10 1/2. Good luck tomorrow and aim small/pick the spot! Even us experienced guys could miss duck soupers sometime.